another simple but recommended project, especially for preschoolers who recognise some letters but aren't yet reading. i wrote out the words we needed, we identified the letters together and went through a pile of catalogues from the recycling finding nice big colourful examples. placing each cut out letter in the appropriate spot on top of my written example made it easy to spot which ones we needed next. 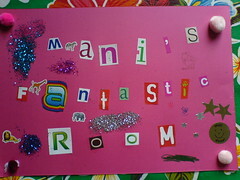 we enjoyed finding the letters so much we decided to add an extra word, it was M's suggestion to make it fantastic. i can't claim originality for this idea, it comes from crafty ideas from junk, recently picked up in a charity shop. oh and i get that this rather lets the cat out of the bag on M's identity, but i figure that pictures aren't searchable, so once this drops off the front page she can return to her shadowy secret life just out of the frame in my photos (lol, if photos had a soundtrack you'd certainly hear her singing in the background on most of mine).